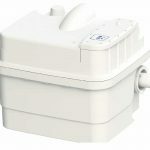 Sanibest Pro Macerator is the perfect above-ground modern plumbing solution that is easy to install and provides highly efficient drainage that connects to the existing system. 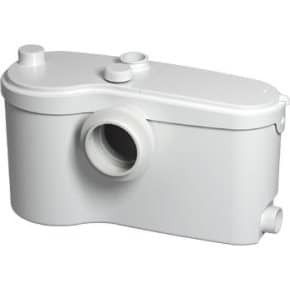 This product is a heavy duty macerator pump that is both quiet and compact and helps to reduce toilet flush waste into a fine slurry that is then discharged under pressure into the main sewer system. The pump can be connected to any existing toilet, bath, bidet, hand basin and shower, which means you can have an additional bathroom anywhere in your home or commercial premises without having to rip up floors or knock down walls to join the new facility to the old system. 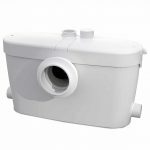 As well as being a cost-effective way of enjoying the benefits of an extra bathroom in your home, business premises, guest house, or hotel without the expense and disruption of having new, below-floor drainage fitted, installing a macerator also means you can fit a bathroom in a building where normal drainage may not be an option or the costs of doing so are prohibitive, such as in a basement. Waste from the toilet is flushed in the normal way and is collected in the macerator box behind the WC. When the effluent reaches a certain level (pre-set at installation), a switch activates high speed blades within the unit which reduces all waste to a fine slurry and discharges it into the main drainage system. A non-return valve prevents any back-flow of effluent. 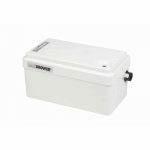 Suitable for heavy duty usage in public or commercial environments, the compact Sanibest Pro model is a small, completely sealed box that can be installed out of the way, behind the WC. Fitted to the wall in this way also makes it easier to get to if necessary. The unit measures 507 cm high x 154 cm wide x 286 cm deep and has two side entries plus one cover entry. 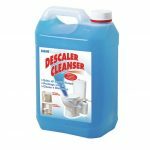 Manufactured to the highest standards, the macerator has a working temperature of 35ºC and meets European standard EN2050-3. To find out more about the Sanest Pro macerator and the many advantages of installing one, please don’t hesitate to email us for details. We offer highly competitive prices on all models and promise fast delivery anywhere in the UK.